Let it be known to the world that I have made the world’s best chewy, gut-healthy gluten free chocolate chip cookies, that are also vegan! They are SO SOFT and AMAZING. No, but really. YOU HAVE TO MAKE THEM. 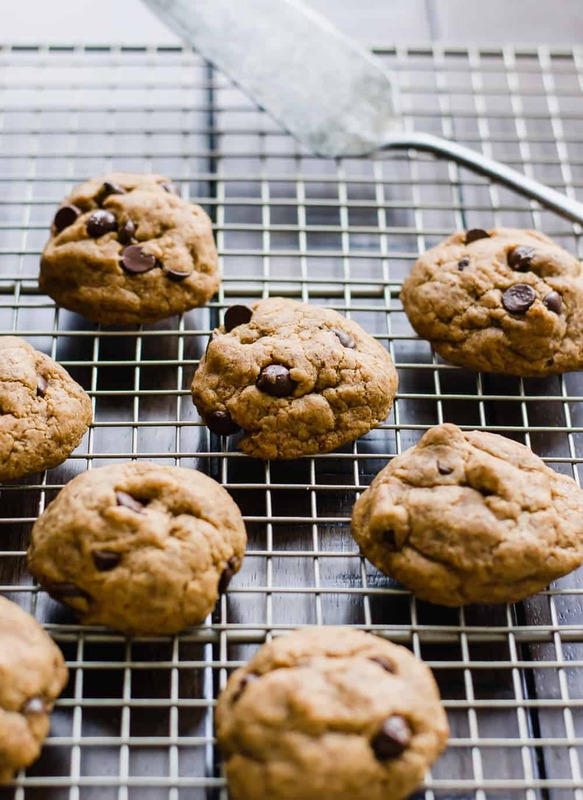 So what makes these gut-healthy gluten free chocolate chip cookies? 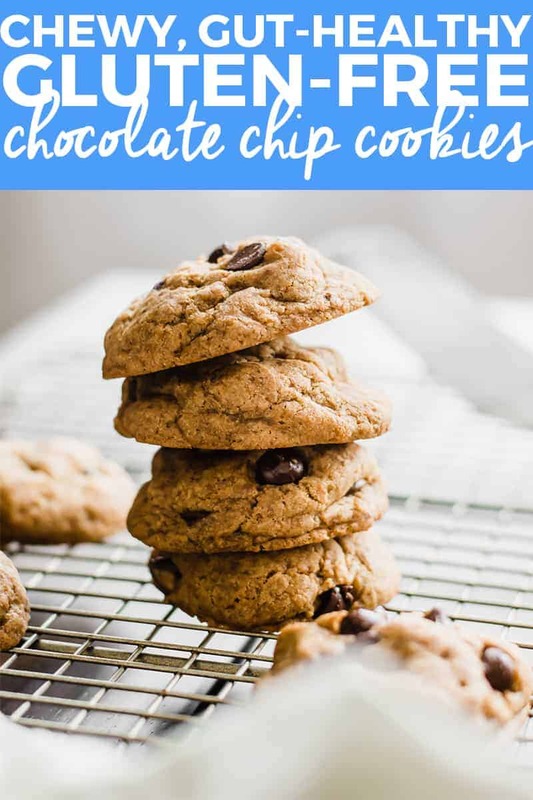 It’s hard to believe that chocolate chip cookies can be dubbed as “healthy.” But trust me when I say I have been testing chocolate chip cookie recipes for over a year now, and I know what works with the good-for-you ingredients! I’ve tried various egg substitutes, sugar ratios, sugar types, etc. And I guarantee this is the softest and chewiest healthy gluten-free vegan chocolate chip cookie. None of the refined sugar and heavier fats that can make you feel sluggish. Is coconut sugar better for you than refined white sugar? The short answer is yes. But here is the long answer explaining why, because I am terrible at being short and succinct. According to a study done by the Philippine Food and Nutrition Research Institute, coconut sugar has a glycemic index of 35 compared to that of regular white sugar, which is 65. Basically that means your blood glucose and insulin doesn’t resemble a roller coaster spiking up and down, and is therefore better for you. But it’s important you buy high quality coconut sugar! Coconut sugar contains various minerals, vitamins, and phytonutrients, which can help your body with things like inflammation and cholesterol. Coconut sugar contains inulin, which can help the growth of good gut bacteria that you would find in probiotics. The second part to why these are gut-healthy cookies, is that they contain flax eggs! Flaxseed is high in fiber (specifically soluble fiber so it aids in digestion) and low in carbs. It is LOADED with omega-3s, which is essential for a healthy heart and brain. Flaxseed also a great anti-inflammatory, meaning it’s good for easing stomach irritability if you struggle with gut issues. Mix 1 tablespoon ground flaxseed with 3 tablespoons warm water. Whisk together in bowl for about 3 minutes until thickened like an egg texture. Your “flax egg” is ready to use immediately! 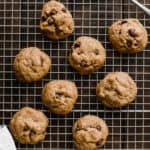 Double this recipe for two eggs, for which this health gluten free chocolate chip cookies recipe calls. 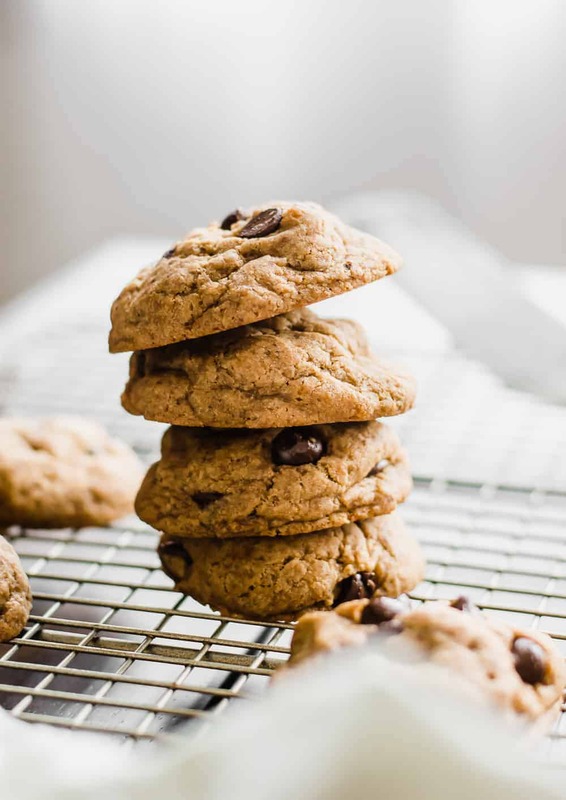 Important tip for making delicious and chewy gluten free vegan chocolate chip cookies! Whatever you do, DO NOT melt the palm shortening. It needs to stay firm when you cream together the sugars. This is what will maintain the cookie shape. If you melt it, the dough will be too runny and you will end up with flat and sad cookies. To avoid runny cookies, make sure you chill these before baking so they keep their nice shape like in the photos! Also, you must make sure you use a quality gluten free baking flour blend. I use the King Arthur Flour mix and love it. They call it a “cup for cup” flour mix, and it lives up to its branding. Honestly, I couldn’t even tell the difference between regular flour. As for vegan and allergy-free chocolate chips, I currently use and love the Enjoy Life brand. They are certified gluten free and yummy! Ready for the recipe now? Okay! 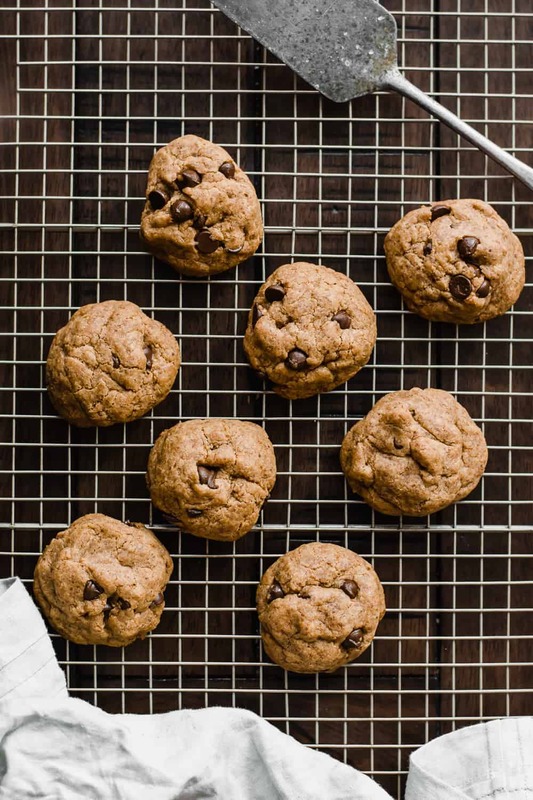 Go make these deliciously chewy and gut-healthy gluten free chocolate chip cookies. Because everyone deserves a cookie. ENJOY! 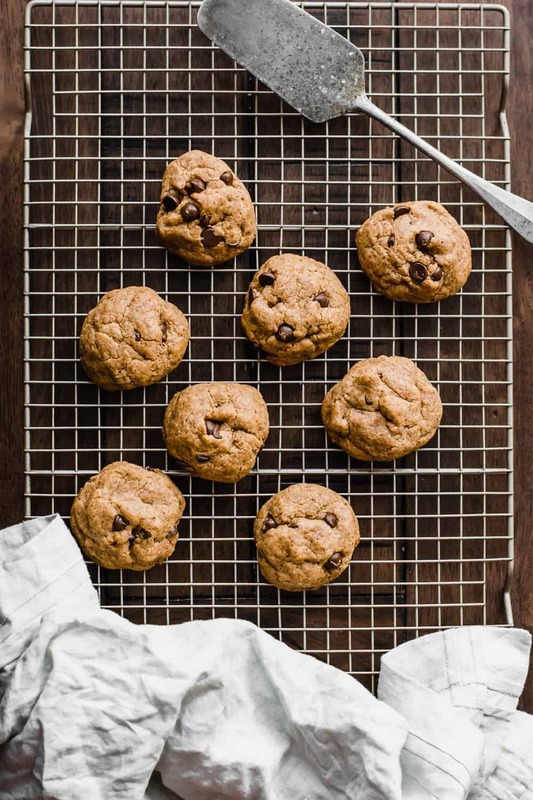 These gut-healthy gluten free chocolate chip cookies are chewy, soft, and vegan! 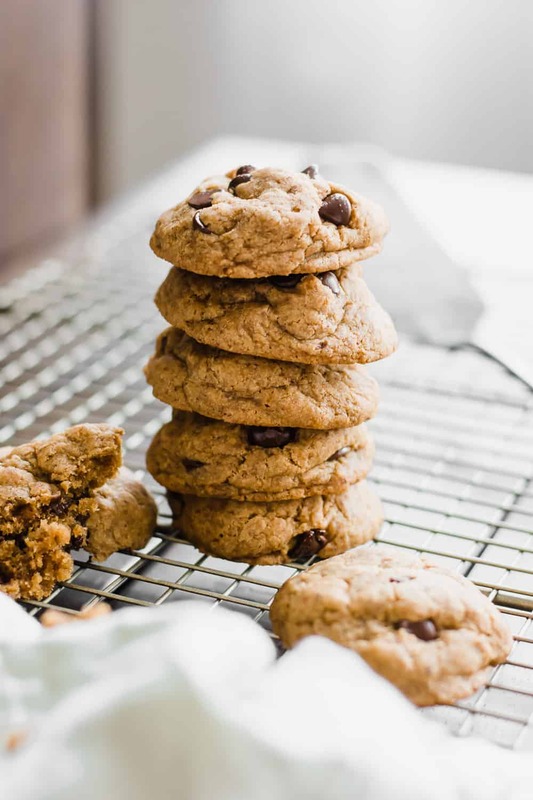 The perfect texture and the best plant-based cookie recipe you'll find. 3/4 cup palm shortening keep it solid, do not melt! Cream together sugar, solid coconut oil, and vanilla in a stand mixer. Mix in flax egg until well blended. Blend in flour, baking powder, and salt. Mix in chocolate chips. Form into 1-inch balls and place 12 on a baking sheet. Cover and chill for 1 hour in refrigerator. Bake on 350°F for 12-15 minutes. Makes about 20 cookies. 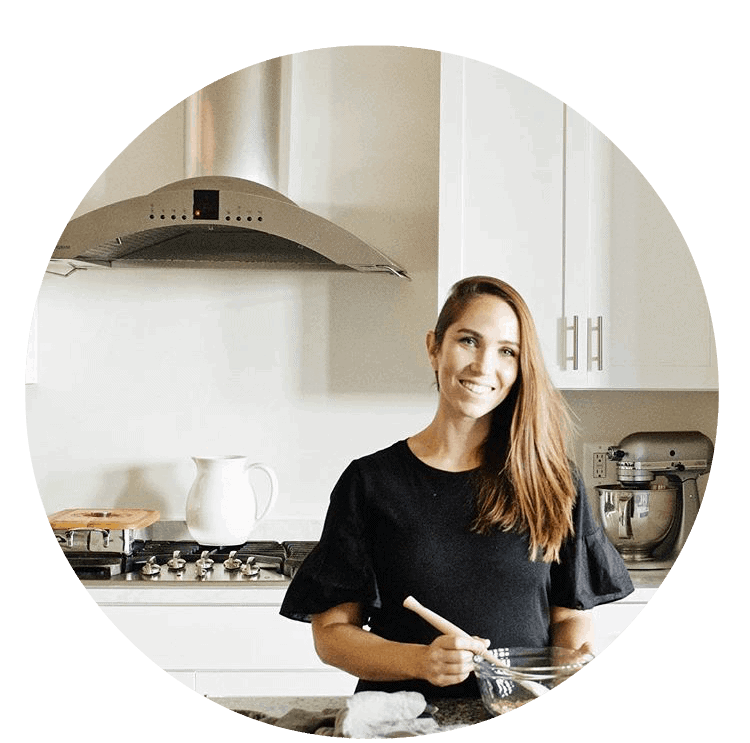 Looking for more healthy gluten free desserts? Try these gluten free black bean brownies!